Heat gas or charcoal grill. Brush bread and avocado halves on both sides with 1/4 cup of the olive oil. Place bread and avocado halves on grill over medium heat. Cover grill; cook 4 to 6 minutes, turning once, until grill marks form on bread and avocados. Transfer to cutting board; cool about 5 minutes or until cool enough to handle. Dice bread and avocados. Meanwhile, in very large bowl, mix remaining 1/2 cup olive oil, the lemon juice, honey, garlic, salt and pepper. Transfer 1/4 cup of the vinaigrette to a medium bowl; add avocados to the medium bowl, and gently toss to coat. 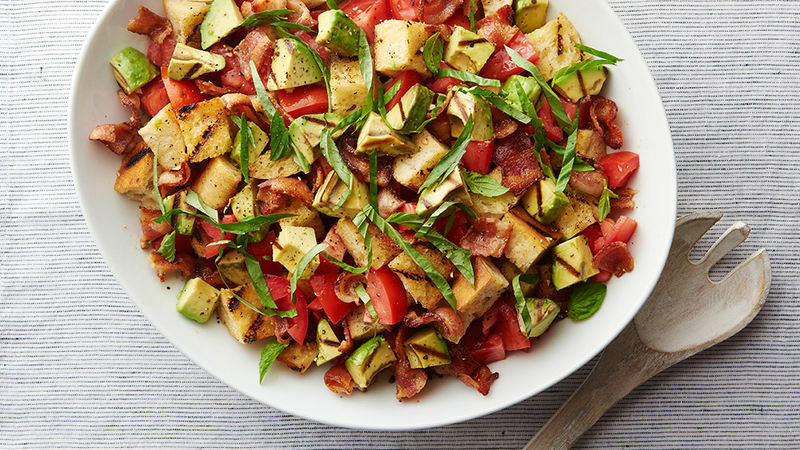 Add tomatoes, bacon and bread to the very large bowl of remaining vinaigrette; toss to coat. Transfer to serving bowl. Top with avocados and basil. Ripe, juicy summer tomatoes are preferable for this recipe, but if your tomatoes aren’t perfect, your salad doesn’t have to suffer! Make up for the lack of juice by keeping the bread a little softer and grilling for a shorter time.